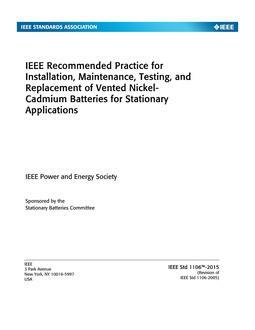 This document provides recommendations for installation design and procedures for installation, maintenance, and testing of vented nickel-cadmium batteries (including partially recombinant types) used for standby operation in stationary applications. This recommended practice also provides guidance for determining when these batteries should be replaced. Separate recommendations are provided for renewable energy systems (e.g., wind turbines and photovoltaic systems), which may provide only partial or intermittent charging. 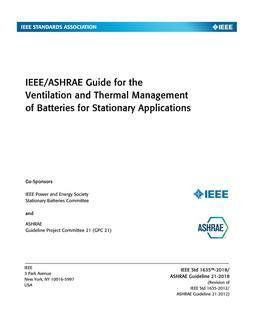 Sizing, qualification, and other battery types, including sealed nickel-cadmium, are also beyond the scope of this document. This recommended practice does not include any other component of the dc system, nor does it include inspection and testing of the overall dc system. Preoperational and periodic dc system tests of chargers and other dc components may require that the battery be connected to the system. Details for these tests will depend on the requirements of the dc system and are beyond the scope of this document. This recommended practice provides procedures that can be used to optimize the reliability and service life of nickel-cadmium batteries in stationary applications. Revision Standard - Active. 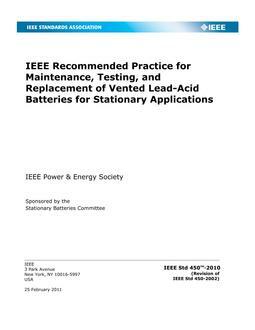 This recommended practice provides recommendations for installation design and for installation, maintenance, and testing procedures that can be used to optimize the life and performance of vented nickel-cadmium batteries, including partially recombinant types, used in stationary applications.